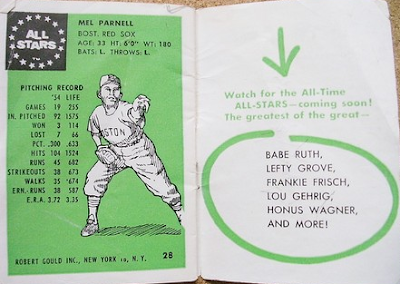 Today's profile features more than just a card, easily sorted and stored. You'll need a modern baseball cube to hold this 3" x 3" statue of Cleveland catcher Jim Hegan and the green-and-white card his statue came rubber-banded to in its original product box. 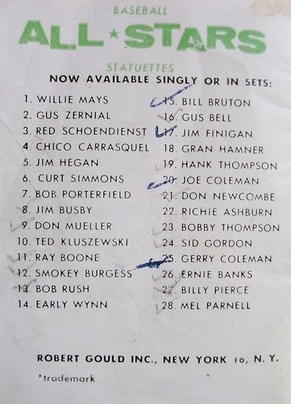 The rare Robert Gould set features 28 players from both leagues, all well-known if not strictly "All Stars" from 1954. 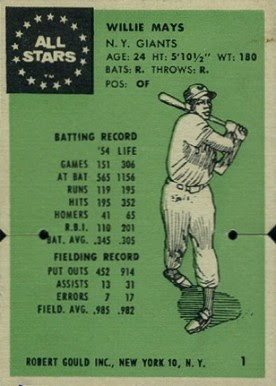 (Hegan, for example, last played for the AL squad in 1952.) 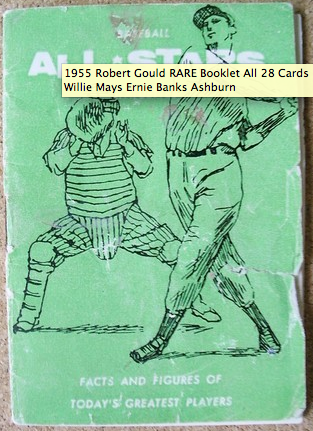 Each appears as a solid white line sketch and statue, even African-American stars like Willie Mays. As implied by this scan, statue poses match what you see on the card. UPDATE: Gould also published this album of all players, front/back cover and two interior scans below. Interesting that you could get them in both singles and sets! 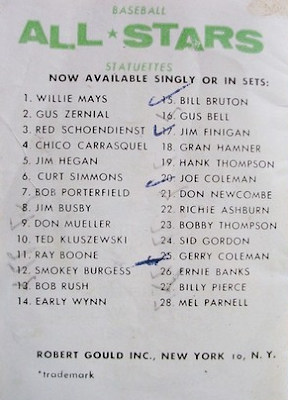 Haven't heard of a special "set box" or the like before--anyone know of anything like that? Value: So few reach the market that it's hard to set a price, though collectors do pay more for cards over statues. 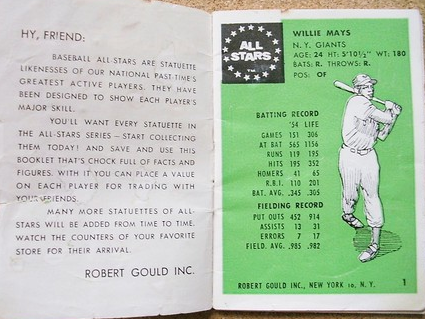 That said, eBay dealers who ask hundreds for singles are dreaming; $75 for non-star card + statue is more likely. Fakes / reprints: Only advanced collectors know much about these statues, making it hard to find an audience for fakes of what's honestly a bland set.